YANGON-BORN artist Smith Sein Lynn is holding his fourth solo show here until the end of the month. A graduate of Rangoon University and trained at the Academy of Art Dresden, Germany, Smith (as he is fondly known in the art circle) is a full-time artist and arts lecturer. 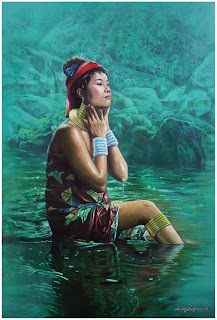 He also operates an art school in Bangkok, where he has been based for the last two decades. In this show entitled "Poetry of Life", Smith celebrates the environment around where he lives and pays tribute to the people he has met and the places he has been to during his travels. In this showcase of over 50 works done in oil, watercolour and mixed media, Smith shows his mastery of the mediums with creations ranging from traditional to contemporary pieces. The soft-spoken veteran artist, who is already 72, has participated in close to over 200 solo and group shows in Southeast Asia and Europe over the past 25 years. The awards he has won, which are as diverse as his works, include the Philip Morris ASEAN Art Awards 2001/2002, the Asean Art Awards 2012 and the Finalist's Award bestowed by International Artist Magazine in 2003. 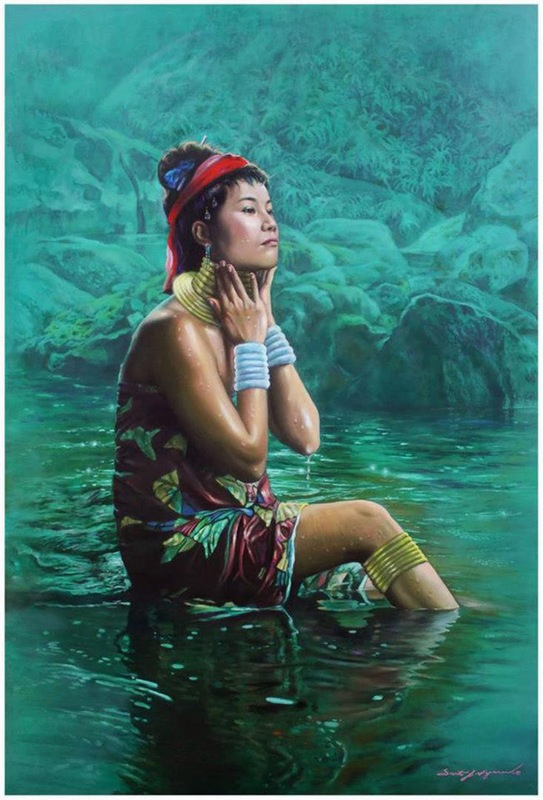 Smith, whose Burmese name Sein Lynn means "Light of the Diamond", says he is captivated by life around him in general and translates what he sees and experiences in his works of realism, transporting the viewers into a fast vanishing world of indigenous people and faraway places. He started painting in watercolour many years ago, and now does mostly oils. When looking at both his watercolour and oil paintings, one cannot help but be awed by his keen eye for detail, especially for an artist of his seniority. 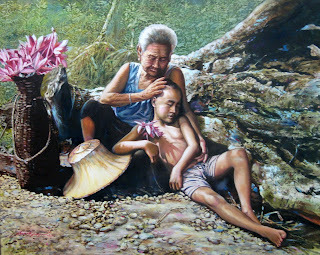 In the piece entitled Affection, an old lotus collector is seen resting with her grandson, leaning against the stump of a fallen tree. The precise placement of light and shade not only brings out the texture of the parch ground and the dried tree stump, but also provided a remarkable contrast between the complexion of the old lady and the boy as unveiled by the strong light. A viewer who noticed streaks of purple in this piece asked Smith about their presence. She wondered if they were merely spontaneous strokes. "The colour represents the spiritual life of these people," Smith said. "In this part of Thailand, there is very little rain and the weather is very hot. Life is very tough here. It is their strong spiritual life that sees them through their challenging days. "This old woman and her grandson were on the way to the market to sell the lotus flowers they had collected. I painted them taking a break to rest, capturing that moment of affection between grandmother and grandson, before they start their journey again." 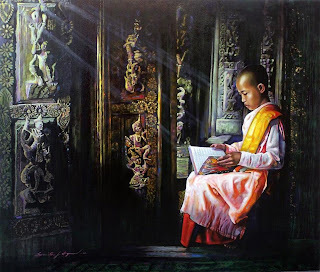 In all Smith's pieces -- whether they are watercolour paintings of fishing villages in Penang or oil pieces of Thai monks making their way to the monastery -- they are full of drama created by the presence of light, often gently hinting the time of the day and setting the mood. In Studying Nun, light streams from an unseen window or doorway to not only illuminate the book in the hands of the nun but also reveals the exquisite carvings on the temple wall which immediately conjures a mood of reverence. 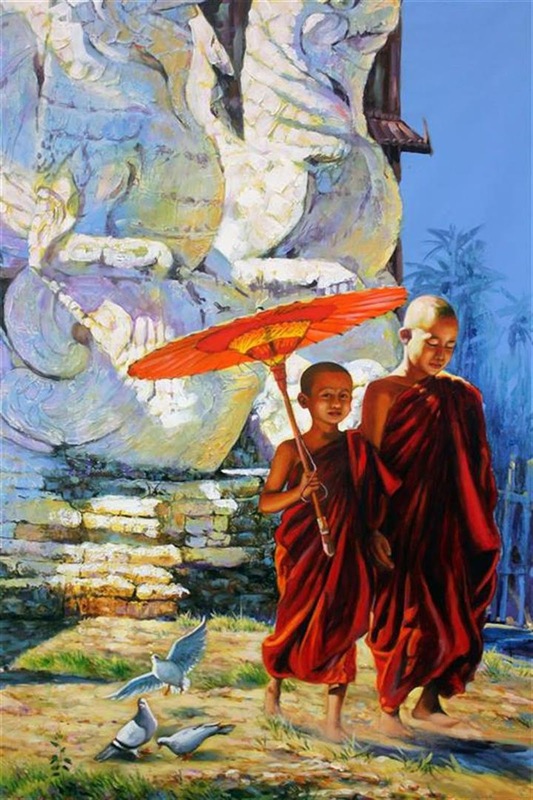 In Monks and the Monastery, two young monks are featured sharing an umbrella and heading out of a monastery, possibly to seek alms. Their calm faces exude a feeling of tranquillity and freedom from worldly worries. This mood is further enhanced by the presence of three white pigeons near the feet of the monks. In this piece, the hot day is depicted on the almost-white sunshine-drenched stone statues, enhanced by the contrasting cast shadows (in light blue). 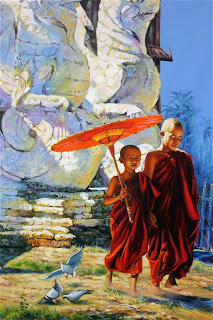 The heat of the day is strengthened by the brown glow of light that filters through the paper umbrella, onto the heads and shoulders of the saffron-robed monks. The placement of reflected light from the ground onto the monks' chins and cheeks in this piece reveals the artist's understanding of light and his mastery of colour values. In Washing Woman (80cm by 100cm, oil on canvas), a cigar-smoking middle-aged woman is seen washing clothes by the stream. The feel of the mid-morning light is hinted with streaks of white across the woman's shoulder, head, and hands, and well-placed specks of more white on the surface of the water around the woman depict swirling eddies of moving water. The biggest piece on this show is Smith's Swan Lake, a triptych of 100cm by 240cm, depicting modern ballet dancers dancing their way into the past. Done in oil using a variety of luminous colours, the dancers come alive under special lighting . For Smith's fans who have been following his series of the Padaung girls, there are a few in this show, too. 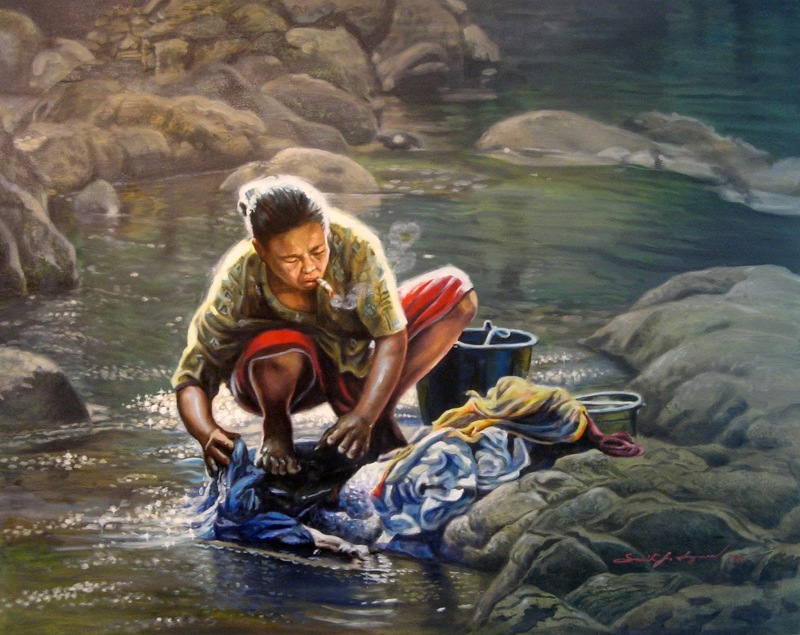 One is the Lovely Padaung Girl (100cm by 150cm) and another features three of the ethnic women bathing in a stream. Smith's exhibition at Younie Gallery ends on June 30. The gallery is at 64, Jalan Kuantan. Opening hours are 11am to 6pm. The gallery is closed on Tuesdays.